I'm not sure why, but I can really relax and whale away at my own face on the page. I'm more free playing around, and I have a better idea what I'm after. Is it because there is no one and nothing to offend? That's not totally true - there are others who might be upset at my face rendered oddly. So what is it? Familiarity with my subject? Thirty plus years of shaving this face in the mirror (the parts without the beard and mustache still need shaving) makes me an expert on this set of shapes? One thing that really opened me up, compared to the subjects I've been attempting lately, was the scale. Larger objects, commanding the space. Like the Toad painting, below, done over a year ago now. And I was inspired by the really impressive drawings (regardless of the tools done to render them) in the credits for Sherlock Holmes. The artist(s) involved in those did an amazing job picking stills to work from, and then turned them into 19th century engraving style, but modern croppings and compositions. I found the combination and the lovely blacks and strong contrast arresting and exciting. It made me want to do faces, up close. Maybe I should work with some photos of strangers, and have an even more free time? Anyway, this made me feel better than I've felt in weeks. 19 x 19 watercolor, white charcoal, and Prismacolor on Arches hot press. * Abner is my older Cotman size 12 watercolor brush. He has less of a point than Louise has. When I was in college, a Philosophy major, I was frustrated that my chosen discipline dealt with ideas like God and prayer in a manner that resembled disection, if they dealt with them at all. The subjects were, hopefully, dead before they were cut up so finely or disregarded as unimportant. But God is very much alive, so I'm not sure what we were dicing or ignoring. It's living itself that analysis can't explain, and life that is the wonder. Having stepped out of church for a while, standing, as I've previously written, like an ox in a field, trying to recollect my sense of relationship with my Divine Father in my figurative red woolly bovine hide and big simple brown-eyed face, steaming in the cold early morning light, I am gradually discovering how I will pray. I had thought this was simply a break, a little fresh air and an indulgence of the imagination to recover balance and perspective, but I now glimpse the possibility that, where prayer is concerned, my whole heart and mind are best engaged in the love and admiration and even obedience of my Lord when I step further into imagination, not back away from it again. The pasture isn't just a side track - it's the first step on a longer road that embraces much more. I was looking again at the Phoenix Berries blog, and I reread the words in her banner. I first read those words almost twenty years ago, during a night spent in retreat at a tiny Trappist monastery. I had picked the book almost at random from the well stocked library - it was a small volume of quotes from the Philokalia which leapt out at me - words of the Desert Fathers. I carried it to my tiny little cell and read it in the deep silence of the small hours of the morning. I was overcome by those lines, caught up in joy and wonder. I seemed to understand all at once what they meant - that we could channel so much of God that we would light up, burn with a heavenly fire. But how was it done? How do we get out of the way? Is it OK to want that? I get distracted and put all sorts of other things and people at the center, spinning off track as a result, running myself in frantic circles trying to control what is outside my control. In recent months it has become clear that beauty is my heart's chief love. It extends into all things. It can govern all behavior. It's how I perceive rightness, holiness, life - I "see" them with the part of me that understands beauty. It's my unique way to apprehend the world, and to see and worship my Lord. So if I pray with my imagination, what will happen? If I seek to govern my actions, my words, and my worship by aligning them with beauty, what will happen? A slab of home made fudge brownie in the bottom of a bowl. A scoop of Mayfield Moollionaire Java ice cream (a cappuccino ice cream with bits of chocolate chip). Thinly sliced bite-size 3 Musketeers bars on top. Eat with a big spoon and make faces so everyone else at the table wants some. I've written before about some highway rest stops in NC, and the balance and rightness of those sites. They're arranged. They're an inspiring lesson on the potential ubiquity of beauty, that anything can be made not only functional but "right" in a way that rests the soul. Those rest stops used to make me smile and breathe more deeply because the sidewalks, buildings, and trees were arranged perfectly. They made use of open spaces and placement to make you FEEL the space, the room, the rest. NC has been tearing these up, one after another, to add a duplicate restroom building. I understand this is to allow one to be open and one closed for major cleaning at all times. This will mean a reduction of cost - only one rest area attendant, regardless of gender, can clean both restrooms while the public is not inconvenienced. But the beauty of all of these sites has been destroyed. And at what cost? Were the decisions made with full knowledge of what was being lost? I'd noticed that many more people actually stopped and RESTED at these sites, compared to others in the Southeast. Aware or not of the reasons, people were affected by the balance of those places. The architecture. Their RIGHTNESS. Did the officials who decided to destroy that know what they were destroying? I was crawling through wooden tunnels with curving walls, which branched repeatedly, splitting to move inward or outward, easy to tell by the way the tunnel shrank or enlarged. 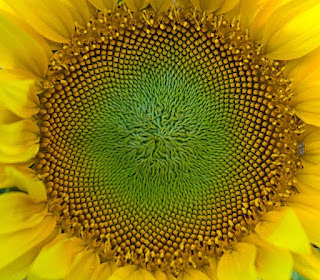 Like moving through hollow seeds in a huge sunflower center, following a fibonacci series in or out. Oldest was with me, just ahead of me, aged eight or nine. He was silent, but radiating excitement that I was finally coming with him to the heart of this place he knew so well. The center, when we arrived, was a five sided chamber, lit as if with reflected sunset light, though there were no openings except the tunnel mouths. The entire structure seemed to be rotating slowly, geologically slowly, like the rotation of the planet beneath us, but separate and different. It felt like the chamber of a heart, like the center of the earth. Oldest was sixteen in the next moment, we were at home, and he was telling me that they had torn down the structure, hauling away all the weathered wood. Grief and rage rose off his skin like steam. "There were other ways to move through the tunnels, which got to other places they didn't know about," he said. "It was an angel." I wanted to weep. A friend's son got wooden fridge magnet animals and his favorites are the lion and the tiger. Dearest's weekly calendar has a photo of two affectionate tigers on the first page. I've started a small watercolor with a lion and a tiger. It's actually the second one in the last week - I did another which did not turn out and has been cut down for CD covers. We are clearing out old stuff in our office, and I ended up taking home an old wooden box (called a cable coffin) which had "DataFlow Education Center" engraved into the lid. I founded the Education Department at DataFlow, over twenty years ago. The system we had in the Ed Center (for whose extra cables the coffin was made) was a "Tiger 16," which had to be reloaded using a technique that involved flipping a pencil switch on the mother board and faking the system into accepting a restore of a different bootstrap partition. This technique was called "Tiger tailing," and I documented our company's instructions for how to do it. I thought of it as I put the box in my trunk yesterday. Youngest's birthday party was today and (as per tradition in this house) he got to choose what the "pin the ____ on the _____" would be. With no hesitation he chose pin the tail on the tiger. What is going on? Is it some kind of message? The photo here is of the tiger I drew, and the tails, which had the kids' names on them, worked into the stripes (they loved that). I scrambled the names in this photo - we don't put others' names on the web... Over in Facebook I'll post the unscrambled shot. We had two rounds of pin the tail, walked down our driveway, with the tiger taped to the garage door. Red bandana tied over the eyes, turn the player three times one way, then one time back the other. Then they walk 25 feet to the tiger... Some were off by 12 feet or more, others (including the birthday boy, who won the first round) were only off by a few inches. We've played this at birthday parties since we moved into this house. It's always something different. Wings on the dragon, last year. Paratrooper on the chute the year before that. They call out hints to each other, which could be right or wrong. "You're way off!" "You're going good! Keep going that way!" "You're going to miss the house completely!" "To the left, to the left, a little more!" Youngest doesn't have much wall left in his room - I wonder if we can get the tiger, and his tail, up somewhere? We'll see. I've always thought tigers beautiful, but until I started drawing them this week, I had never observed how individual each one is - how unique their builds, faces, stripe patterns. And now I feel their beauty not only at an abstract level, but up into my hands and arms, as if I'd been touching and building tigers myself. This is one of the miracles of drawing and painting, for me. I had to turn on comment moderation "after 5 days from post date" to cut off the later comments of spammers. That's worked great, but now I have some legitimate and heartfelt comments which I don't see for days or weeks, even. Like one from Susan left on the 12th of December... I read it today and was moved. I wanted to take a moment, before I jump into a small painting (I think I can fit) to thank all of you who visit and comment. My family is my first audience, and you are the next. Both are important in different ways, and painting has more depth and meaning for all of you looking and remarking. Happy New Year to all of you. Let's see what 2010 will be about.